What’s wrong with my website? How to Grow Your Business and Dominate the World! Twitter is often filled with such headlines, linking to stories that promise to teach you how to make your business bigger. Well, guess what? I’m not interested, thank you very much. I run a small business. It’s successful. I’m happy. My clients are happy. And I wouldn’t want to change a thing. I love writing about destinations and things to do and see. I’ve worked for a travel magazine before and been involved in travel websites for more than a decade. In my current job, I’m lucky to regularly get copywriting jobs for tourism destinations, attractions and places to stay. There’s no destination I know better and have written more about than Coffs Harbour and the surrounding Coffs Coast on the beautiful North Coast of New South Wales. This is where I’ve lived since 2005 and it’s a wonderful part of the world. The Coffs Harbour Jetty is the city’s most popular suburb and encompasses the harbour, marina and the historic jetty (pier) it’s named after. This suburb is currently being rebranded as an urban village with the name “Jetty Harbourside”. It really is like a seaside village but it has everything you need plus it’s just 3 minutes by car from the Coffs Harbour City Centre and 5 minutes from the airport. I love “my” Jetty suburb and I was thrilled to be given the opportunity to write the copy for a new brochure promoting the Jetty Harbourside village to both visitors and locals. I realised I haven’t blogged about a work project for quite some time – probably because I’ve been so busy trying to meet deadlines that I simply haven’t allowed myself the time for it. One interesting project I recently finished was rewriting an Ebook for Kylie Hammond Executive Search & Coaching Group. The Australian-based but internationally operating firm helps top executives find and secure suitable employment and places top talent with blue-chip and other reputable companies in Australia and overseas. Kylie Hammond engaged my services to restructure and rewrite a complimentary Ebook the fim has been giving away on its site for free for a while: The Executive Candidate Survival Guide. I’m very happy to report that it’s been a huge success! I’ve been consistently busy with a steady stream of new projects and clients, particularly since January this year. In addition to being a web copywriter and SEO specialist, I am also a freelance journalist. One project that I’ve worked on in that capacity in recent weeks has just been published, and doesn’t it look great! 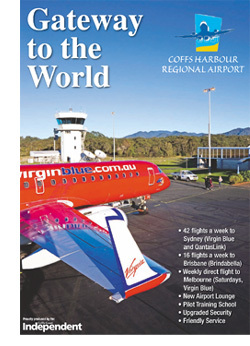 The project saw me researching and writing 16 stories for an 8-page sponsored newspaper supplement about the Coffs Harbour Regional Airport. The supplement was delivered as a wrap-around to today’s Coffs Coast Independent newspaper which is delivered door to door in the Coffs Coast area. For this project, I’ve worked closely with the Airport Manager and have interviewed more than a dozen people, done a lot of research and spent many mornings and afternoons touring and hanging around the Coffs Harbour Airport.